The Harmony software means tunes from Real's net store will play on iPods, as well as Microsoft-compatible devices. The program mimics Apple's copy protection software, so Real says it has not infringed Apple's intellectual property rights by developing it. "We are making it so that consumers can buy music once and play it anywhere," said Rob Glaser, RealNetworks chief executive. It says its engineers used publicly-available information in order to work out how to make files compatible with Apple's digital rights management (DRM) software, which is called FairPlay. This DRM is a standard which is supposed to stop unauthorised copying or playback of tracks. Real's software means when a user buys a song from its shop, currently only available for US customers, the Harmony program will check the music device the tune is to be played on and will change its format if necessary. Apple has previously reacted strongly to attempts at cracking its DRM software, and it has resisted calls to license its FairPlay copy-protection software. The company said it was unable to comment on this issue at this time. Currently, only one music player, the Creative Nomad Jukebox Zen Xtra, supports tracks downloaded from Real's store, which is currently only available in the US, as well as some personal digital assistants. 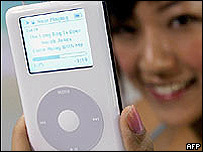 A study by London-based Informa Media has predicted that more than 21 million mobile music players will be in use around the world by the end of 2004, including five million iPods. 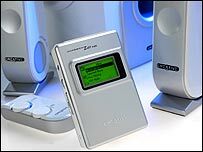 But there has been a certain amount of frustration and criticism of companies which have released digital music devices that only play particular file formats. This has meant that files downloaded from one online music service or prepared for one player may not transfer to another.